We have a large versatile studio and exhibition space for hire right in the heart of Colchester town centre. 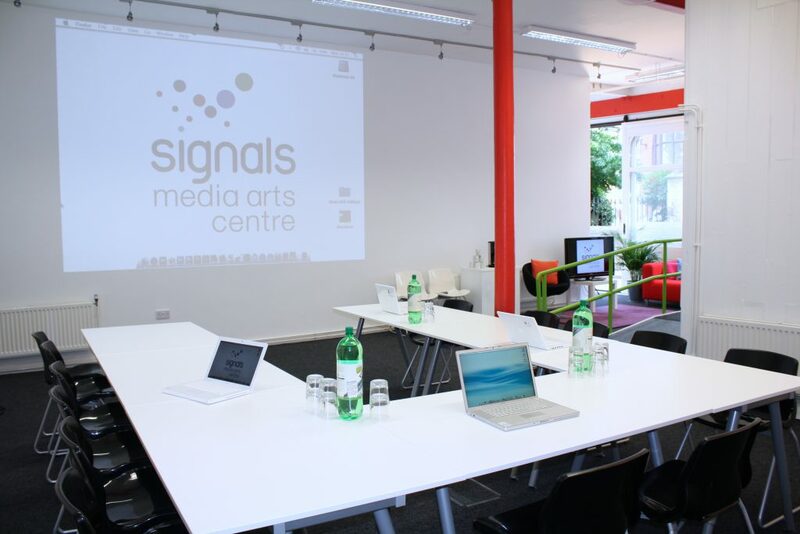 Ideal for meetings, workshops, courses, conferences, screenings or as a rehearsal area, our space provides a fresh, accessible and welcoming atmosphere. Seating for up to 30 people in a conference style and 18 people in a boardroom style however we are very flexible, just let us know what set-up you might need. Fully accessible self contained ground floor space with access to a small kitchen and accessible toilet. Video door entry system, so your visitors can come and go easily. Free use of a full HD 40” LCD flatscreen tv. We can also arrange for lunches to be delivered. Our basic rate starts at £60 per 1/2 day, and £100 for a full day (9am – 5.00pm) Call for information on evening and weekend hire rates. Please note you may be asked to pay a deposit to secure a booking. If you wish to cancel a booking you should let us know at least 7 days in advance of your hire or you will be subject to a charge of half the hire fee. If you cancel within 24 hours for the hire date you will be charged the full hire rate.